COLUMBUS, Ohio — A gathering of hundreds of physicists represented a perfect opportunity. 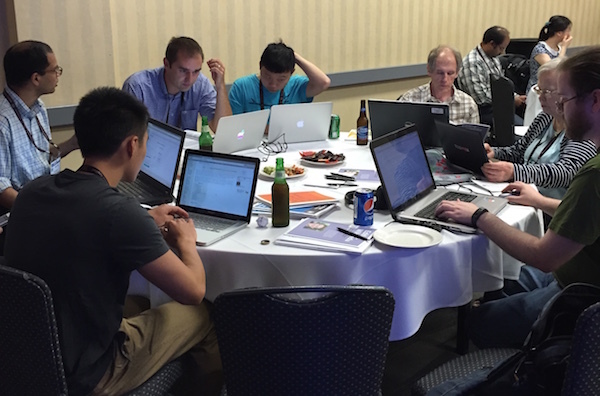 They had come to this university town for an American Physical Society (APS) meeting, and so the Simons Foundation, seizing the chance to tap their collective wisdom, launched its first edit-a-thon aimed at improving the quality of physics information on Wikipedia. The goal was relatively modest: Work on 30 or so physics pages that suffered from either a lack of content or a lack of accurate content. In all, some two dozen physicists stepped up for the three-hour editing session on a Monday afternoon in June. Wikipedia editing is generally simple. After creating an account, users are able to go to virtually any page and begin marking up entries. A “sandbox” training area enables users to practice creating hyperlinks, citations and other page attributes without the edits going live. A three-hour edit-a-thon would not allow time for such practice, however. Fortunately, the three group leaders — Maxwell Parsons of Harvard University, Amar Vutha of York University in Toronto, and Brandon Rodenburg of the Rochester Institute of Technology in New York — were Wikipedia-savvy. Recruited through social media, an ad on the APS website and informal networking, they trained ahead of time (in exchange for the foundation covering their meeting registration fee) and made the participants feel comfortable. Wikipedia’s site also helped volunteers with online tutorials. Perhaps the most useful resource was “The Wikipedia Adventure,” which covered the basics of editing pages. Facilitating the event was Lane Rasberry, a prominent editor of Wikipedia pages. He is also “Wikipedian in residence” at Consumer Reports, which began formally contributing to articles and organizing tutorials for Wikipedia in 2012. For the day’s editing, Rasberry created special access for participants to get around Wikipedia’s restriction of no more than six accounts from a single IP address. Also keeping the edit-a-thon moving was a build-your-own-nachos bar — and beer. Within 20 minutes the event was in full swing and the room was filled mostly with graduate students and postdocs, sitting at round tables that were covered with laptop computers, notepads and snack food. While some attendees worked solo, others clustered together in groups of four or five, all hunched over one laptop as they crafted a plan for editing a page they all agreed needed work. Multiple users can edit the same Wikipedia page simultaneously, so the strategy for most attendees seemed to be group discussion, followed by task delineation and, finally, editing. A specially created Wikipedia “class page” tracked the edits. It could tally, in real time, the total number of edits made, pages edited and pages created. During the event, and in the weeks that followed, the group edited 51 existing physics pages, including Speed of Light, Quantum simulator, and Squeezed Coherent State. They also created four new ones: Quantum Feedback, Sub-Doppler Cooling, Evaporative Cooling, and, fittingly, DAMOP — which stands for the Division of Atomic, Molecular and Optical Physics, the APS department that held the conference. Rasberry says that most of the edits have “stuck.” Based on past data from articles on similarly esoteric subjects, the “stickiness” of the changes implies that the new content is good and that the editors had a strong understanding of Wikipedia guidelines. “You can conservatively and safely say,” he says, “that the content added is requested and viewed 50,000 times a month.” Not bad for subject areas many would deem inaccessible.